The Poke 'N Pull is a handy device for quilters to use to pull errant threads out from underneath the quilt top without doing damage to the quilt. 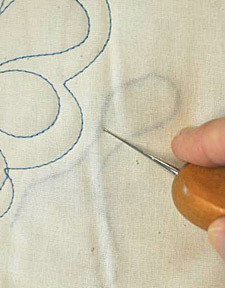 Most quilters have inadvertently left a thread in the batting layer under the top and then quilted around the thread so that it can't easily be removed. The Poke 'N Pull will allow you to easily pull these offending threads out without damaging the quilt top. The "business end" of the Poke 'N Pull has a very small hook on it which is used to safely catch the errant thread. The handle is made of hardwood which is sanded and polished to a fine finish. 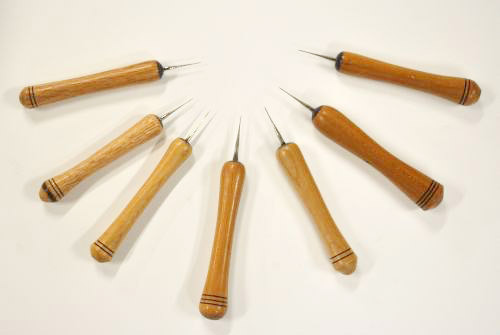 As with the No Roll Seam Rippers, the handle is ergonomically designed to feel comfortable in the hand. At the end with the metal tip, the handle has a flat spot which is in line with the hook at the tip so you can easily locate the hook during use. Simply poke the sharp, hooked end of the Poke 'N Pull through the top quilt layer, hook it onto the offending thread, and carefully pull the thread back through the top. 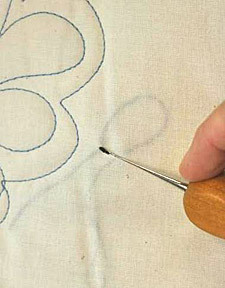 Once you have the thread out, brush over the hole with your fingertips to smooth over the hole and make it disappear. Poke 'N Pull is available in either Pennsylvania Black Cherry or Red Oak. FIGURE 1. FIND THE OFFENDING THREAD IN THE QUILT TOP AND POKE THROUGH TO GRAB IT. FIGURE 2. NOW, PULL THE THREAD THROUGH THE TOP TO REMOVE IT.